Although my first and formative foray into the world of fragrance came via The Body Shop many,many moons ago in the guise of Fuzzy Peach, Dewberry and White Musk, things have certainly changed in Body Shop HQ with this brand new line of EDTs and matching perfumed body care range, the Scents Of The World Collection. Made with 100% organic alcohol (Community Fair Trade & made from Sugarcane) and natural extracts sourced from the far reaches of the world, you'd be hard pressed not to find a fragrance in this new line to suit your taste. Indian Night Jasmine: sandalwood, violet leaves, orange blossom and jasmine combine to make a more sultry fragrance. Atlas Mountain Rose: comprised of citrus, rose, musk and amber, I can see this one having the most universal appeal of the 5. Amazonian Wild Lily: with iris, white lily and orchid, enriched with papaya fruit zest, this is the liveliest of the five. Uplifting and invigorating. You can clearly see the loving Madagascan Vanilla Flower has been getting. I was sent both Madagascan Vanilla Flower and Amazonian Wild Lily to try and I can't let this post pass without singing from the rooftops about the former. Madagascan Vanilla Flower smells to me like a warm tropical breeze. One deep inhalation and I'm lying on a beach, drifting off to the sound of palm trees swaying, waves gently crashing and feeling the gentle breeze roll over me as I bake in the sun. Really. It's that good. Amazonian Wild Lily is a much livelier affair altogether, the forest florals punched through with papaya zest make it an ideal day time spritz. Available from The Body Shop online for UK customers or in store from this week, the Scents of The World is definitely a collection worth a sniff. Or ten. 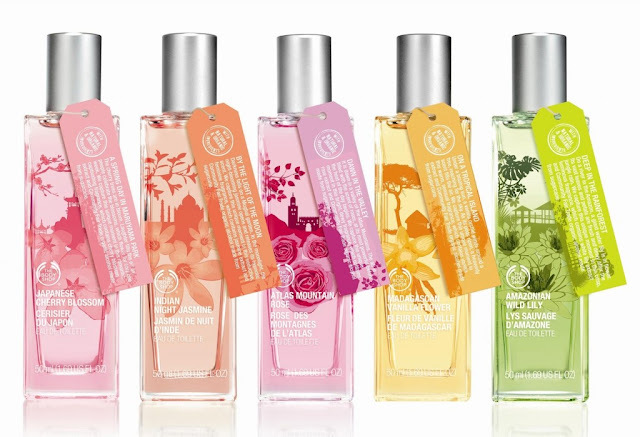 Are you a BodyShop fragrance fan? More importantly were you a Fuzzy Peach or White Musk fan? My mum still loves the smell of white musk! I'm not gone on vanilla as a perfume but I love the sound of the Lily one! My Mum also still hoards white musk whenever she can find it, I was a Dewberry girl all the way, used to keep the shaped soaps in my sock drawer! I used to love the White Musk, ahh the memories, Do you know how much these will be??? Movie Fest 2012 - Get Your Tickets Toute Suite! Happy Birthday Jervis Inglot: Sale Heads Up! Step Up 4 - Sports Merchandise Giveaway! Movie Fest 2012 - Attention Must Be Paid!